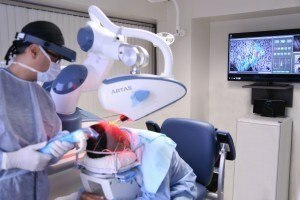 The ARTAS System is one of the most advanced techniques in FUE hair restoration. 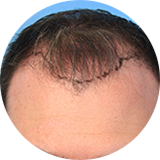 ARTAS has a Robotic arm that allows for harvesting hair from the donor area in patients with male patterned baldness using the Follicular Unit Extraction method (r-FUE). 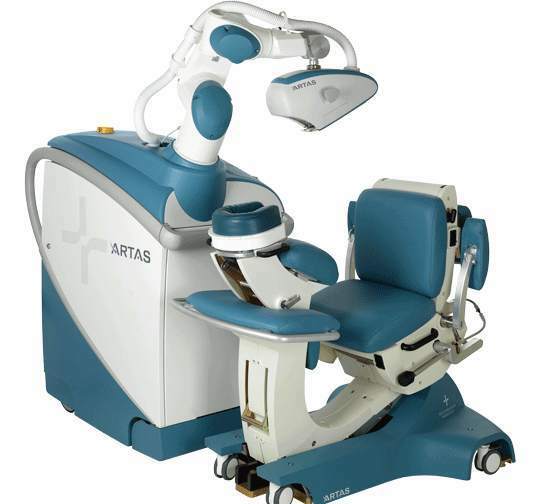 The ARTAS uses computer assistance to harvest hair follicles for hair transplantation. The system incorporates a number of elements in its operation, including an image-guided robotic arm and special imaging software that coordinate together for harvesting follicular unit grafts, individually and precisely. The ARTAS System enables our medical staff to extract hair follicular units more rapidly and with higher precision. The system is equipped with a sophisticated algorithm that facilitates mapping and collecting of follicular units. Random harvesting of the units is designed by the system to minimize the risk of scarring and over harvesting. Patients who receive the ARTAS FUE procedure can usually return to normal activities the day after procedure. The hair transplant surgeon determines and marks the donor area, also known as permanent zone, in the back and sides of the scalp. After application of the numbing medications, the patient is placed in sitting position, putting their face over a donut shaped pillow for maximum stability and comfort. Then, a tensioner is placed over the donor area to stabilize the skin for the harvesting process. ARTAS uses several cameras to capture microscopic video images of the patient’s follicular units. The hairs are then easily identified by the 3D microscopic camera of the robot. Hair direction and exit angles are not the same in different parts of scalp. The robot constantly monitors the exit angle of hair and calculates the internal hair axis based on the collected data. The ARTAS software identifies and computes hair features such as, number of hair per follicular unit, hair exit angle, direction and overall density of hair in each area. The gathered information is processed with ARTAS’s algorithm and generates a plan for harvesting hair follicles with high accuracy. The robotic arm will be adjusted based on the processed information from the 3D camera system. After identification of individual follicular units, they will be reaped individually with the robotic dual punch system, optimizing the quality of the extracted hair follicles. The doctor and medical staff operate the system by making adjustments to fine-tune the dissection of follicular unit grafts. The ARTAS robotic hair-harvesting system is an advanced device that enhances the safety and precision of hair restoration procedures. Combination of our artistic approach and Robotic advanced technology makes r-FUE a safe and effective hair restoration method.